New York is a magical place. It's considered one of the most important food cities in America, it's home to Broadway, an inordinate amount of books, movies, and television series have been set there, it's a worldwide fashion capital and girls from around the world vie for a chance to be part of the city's illustrious ballet companies. It's also known as a city that embraces dreams and offers up a world of possibilities both large and small. If you can make it there, you can make it anywhere. However, Cartier and caviar aren't the only things that New York is known for. As a mecca of American and global culture, New York is home to one of the most famous halls of classical music: Lincoln Center. Famed musicians and singers from around the world have graced its stage and wowed audiences for decades. But I bet you wouldn't expect that to be the subject of a YA novel, right? 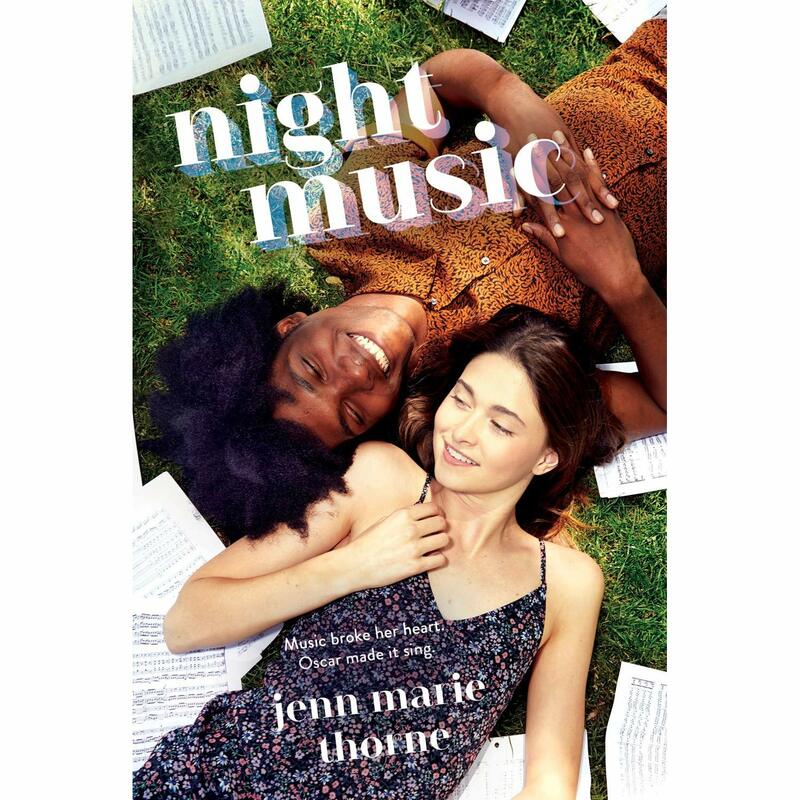 The worlds of New York and classical music is, in fact, at the epicenter of Jenn Marie Thorne's newest release Night Music. Ruby Chertok is classical music royalty. Or at least her family is. Her mother is a world-renowned pianist, her dad is one of the most notable composers and conductors in modern classical music, her sister is a first chair violinist, her brother is a conductor and composer, and her oldest brother has always been incredibly gifted in terms of music. No matter how hard she tries, Ruby just doesn't feel like she belongs. She can play piano, but not as well as the rest of her family and she can't really compose. So where does this leave her? In the summer of her contemplation — and eventual liberation from bottom of the totem pole to forging her own path — Ruby meets Oscar. He's an internet phenomenon that her father has personally brought to the Amberley School of Music to make his mentee. He sees potential for Oscar, but he also sees dollar signs and donations. Of course, Oscar doesn't know that he's being used as a pawn as he creates his first symphony because he's under so much pressure to succeed. The pressure to find yourself not only in the classical music world, but in the world itself is at the heart of Night Music. Ruby is desperate to find her purpose while Oscar just wants to find his place in a world that doesn't accept who he is or who he loves. It's a dual coming-of-age story that explores the steps we need to take to figure out who we are and what we want out of life. Luckily, I was able to talk to Jenn Marie Thorne about her lovely new novel. Congratulations! Night Music is finally out there! How does it feel? Jenn: It’s a little surreal! Night Music has had a long journey from initial idea to publication. My totally unscientific theory is that the longer you’ve worked on a book, the harder it is to let it go and hand it over to readers. But at the same time, the response has been really positive so far, and of course I’m proud to have it out there. Classical music, whether it be through composing or performance, is an interesting choice for a YA story. What inspired that? The first spark of the idea was actually for a fantasy novel, if you can believe it. I was interested in the idea of a non-magical person in a magical world with a sort of failed birthright falling for a very powerful magician. The idea kind of got stuck there until I realized why I’d come up with it in the first place, as a way of processing my own disappointment over not pursuing a career in music. I’ve always loved classical music and studied classical voice for many years; but deep down, I always knew I didn’t have the natural ability that would enable me to really make a go of it. It’s hard to accept that the thing you love doesn’t fully love you back — but it does help to write a whole book about it! What was the research like for this project? Did you go and experience the magic firsthand? When I lived in New York, I spent a lot of time at Lincoln Center. I probably shouldn’t admit this, but my friends and I used to buy really cheap seats for the Metropolitan Opera, then sneak into empty seats in the front row during the first intermission. I did, of course, research the music world in more detail with the help of a few friends who are professional musicians. I must say, I’m desperate to get back to New York after spending so much time there in my imagination over the course of writing the book. Music is also a huge part of NYC culture, especially the Met Opera and Lincoln Center, but are very rarely the center of the NYC story. Why do you feel that is? Well, there’s a lot going on in New York, right? And much of it is probably more accessible than the classical music world. I think to people who aren’t avid fans, Lincoln Center can feel a little insular and off-putting. Another reason I think you don’t see music as a central theme as much as, say, ballet is that it’s really hard to write! There’s that old expression, “Writing about music is like dancing about architecture,” and I do think it presents a daunting challenge. Something that's clear throughout the story is the difference between Ruby, Oscar, and Jules. Ruby has it all while Jules is struggling, but Jules is much more confident than Ruby. Oscar has all of the talent and charisma, while Ruby's family is a classical music legacy and she's extremely shy. Did you want to create those differences between the characters or was it organic? I would love to say that I carefully planned and outlined each character to serve as a useful counterpoint to each other, but it was a happy accident in this case. Funnily enough, Jules was the first fully-formed character that I got my head around, then the adult characters, then Oscar, and Ruby arrived last — probably because she’s the character who’s closest to myself and I’ve always found it excruciating to write about myself. What wound up informing the confidence levels of each of the characters was their histories. Jules is essentially a foundling with a fantastic guardian, and as a result, she’s been able to bolster her confidence in a way that’s often a bit defensive. Oscar comes from a loving and supportive home, whereas Ruby’s upbringing has been extremely haphazard and left her feeling like an add-on who should just be grateful to be along for the ride. Another thing I found interesting was Oscar pointing out that his talent, his love of classical music, and desire to be a composer made him the odd one out even more than his ethnicity did. Why do you think that is? Do you think there's a sort of racial bias in terms of classical music? There’s an absolute racial bias in the classical music world, despite the prevalence of blind auditions today, and the problem starts early. Nonprofits like the Sphinx Organization and Castle of our Skins provide music education for Black and Latinx children and promote the work of Black musicians and composers, respectively. There’s a lot left to be done on a systemic level to acknowledge and address the diversity issue within classical music. That being said, I think anyone being raised outside of the classical music bubble with Oscar’s level of genius would feel like the odd man out. There's a lot of mental struggle throughout the book. Ruby is constantly wondering what she can do to have an impact as she navigates moving out of her family's spotlight, while Oscar starts having dark days filled with panic attacks. I would say that most people in the arts are often riddled with anxiety. Did you want to highlight that for any particular reason? Maybe this is my own personal lens, but it seems to me that anxiety is a huge issue for a lot of teens and adults that often isn’t explicitly portrayed in fiction, so in Night Music, I wanted Oscar and Ruby to deal with the pressures that have been placed on them in a way that to me felt authentic. Okay! Now to the fun questions! If this were to become a movie, who would be in your dream cast? I’m so bad at casting my main characters, because they are so particularly themselves in my brain that I have a hard time picturing someone new in the role. I’ve got some adults, though, for the supporting cast: Bryce Dallas Howard for Nora and Mandy Patinkin is Marty Chertok. This doesn’t often happen, but he was head-canon as Marty before I even started writing the book! What was the writing process like? Epic. I wrote a very quick rough draft before I moved to England, then almost completely rewrote it after moving to England. There was a lot of back and forth and incredible beta reader input and then one day, magically, it was in ARCs! You’re not far off! I listened to classical music constantly while I wasn’t writing, especially the pieces featured in the story, but I am an extremely distractible person, so while I was doing the actual work, I needed silence or I would just, like, start singing opera and two hours would have passed with zero words written. What would you like readers to take away from Night Music? Your life is your own and it’s your one true art. Your worth is inherent, whether you’re gifted or not. Be kind, be brave, love wildly, and enjoy yourself. And finally, what are you reading right now? I’m finally reading Circe by Madeline Miller (who I went to high school with!) and it’s as incredible an achievement as everybody said. Night Music (from Penguin Teen) hit shelves today! Make sure to pick up a copy for your spring break reading or for a lovely love story to devour in a weekend!